Barbados is a world class surfing destination and island getaway for anyone looking to experience the true island life. As the Eastern most Caribbean Island, Barbados is considered part of the West Indies — although locals will tell you that they do not belong to the Caribbean because the island sits so far outside of the chain so usually associated with the Caribbean. Barbados lies just over one hundred miles to the East/Northeast of Venezuela and it is a coral reef rock island. The island is very small, only about thirty miles long and fifteen miles wide. You would not realize the size though if you visited the country because it is packed with things to do, businesses, and roads that can have you driving around the island for days. This tiny country is made up of eleven parishes (Christ Church, St. Andrew, St. George, St. James, St. John, St. Joseph, St. Lucy, St. Michael, St. Peter, St. Philip, and St. Thomas) and one capital city named Bridgetown. Bridgetown has the most history as well as industry. The capital was once the main port for early settlers and English colonial rule. Today Bridgetown is the main port for cruise ships and cargo ships; it also is home to the majority of international business headquarters and market places. There are many reasons to visit Barbados. Most tourists come to experience an island paradise getaway revolving around delicious world class dining, tropical cocktails poured by authentic mixologists, and duty free shopping at high end boutiques. 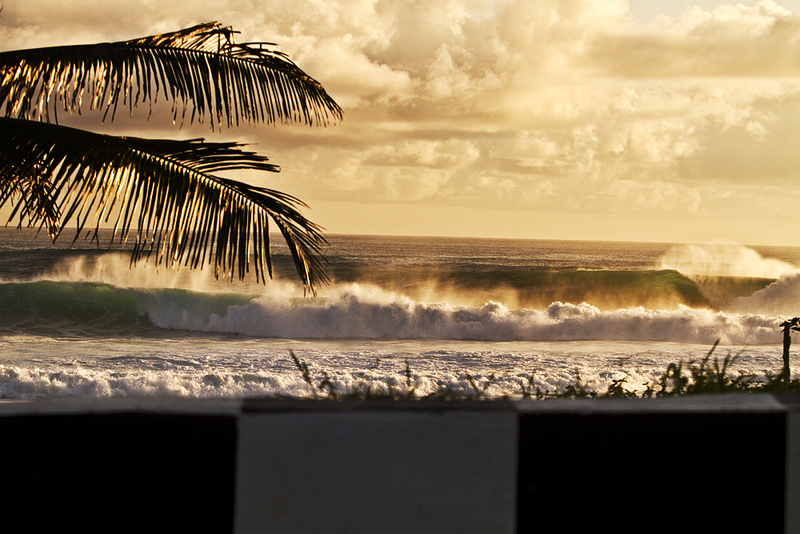 However, there are many other reasons to travel to Barbados such as surfing. Surfing is actually fast becoming the premier attraction in Barbados with epic breaks that crash all over the island. World class waves break on all sides of the island and come in consistently for experienced surfers and beginners alike. While visiting the horse race track, the sugar cane factories, the party spots, or the historical cultural element, surfing is a culture in Barbados all to itself. Each side of the island has different conditions. Typically the east coast is epic from August through December but when the wind switches to onshore it can get big and messy, onshore Soup Bowl is no walk in the park. The strong trade winds blowing from the East/Northeast create clean textured conditions on the South Coast at spots like Freights, South Point, and Brandons. If you are lucky, you may get the West Coast when a strong North swell comes down. North swells wrap around the West Coast and combine with the East winds which offer up some of the cleanest rights and lefts you could ever surf. Once you surf Barbados, you will not want to surf anywhere else! The east coast is the place to be for rights which do break pretty much ALL YEAR ROUND! When a good North Swell comes down, the West Coast will fire and you will have to experience it. Try Duppies at the North West tip, or go a little further down the West to Maycocks. Maycocks breaks in front of the cement factory at the Northern part of the West Coast. The cool thing about the West Coast on a good North swell is that there are tons of little nooks and crannies to explore. You can still find lefts breaking on the east coast and if you are an experienced surfer then you can always hit that quick left that breaks to the other side of Soup Bowl. When the swells come from the East or South lefts are abundant. Between August and March you will find the best conditions for lefts. Usually between December and March the trade winds are a little too strong onshore for the East Coast so the South will be your best bet. Occasionally a large North swell comes down on Barbados. When this happens the West Coast lights up! There are a couple world-class lefts that work with a good North Swell like Tropicana and Sandy Lane plus you can easily find a perfect nook up and down the coast. With the strong trade winds blowing from east to west, the west coast gets perfect offshore conditions. So, if you’re looking to travel to an island paradise then look no further than Barbados. If surfing is your passion then you have found the right fit with a getaway to Barbados. The locals are very friendly, the food is great, the drinks are abundant, the waves never stop and the same goes for the party. Anytime of the year is good but the best time to visit would definitely be between October and May. So go experience a vacation like no other, experience the real Barbados on your own terms! The cheapest flights always depart from JFK in New York and are non-stop flights with an air time averaging 4 hours and 45 minutes. JetBlue has been the most consistent airline and charges the least amount for surf bags (US $50). To book your own Barbados vacation visit www.therealbarbados.com to receive a free travel consultation with everything you need to know about experiencing all this wonderful island has to offer. Eric Magliacane is a surf lifestyle entrepreneur that has spent many years living and working in Barbados. He has forged strong relationships with many local Barbadians and travel destinations on the island. He is founder of The Real Barbados travel consultant agency with the mission of sharing everything this amazing island has to offer.